We are living in what might be called "ecological end times." 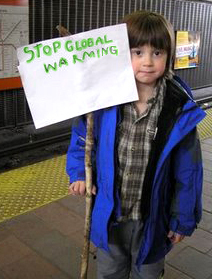 Absent a massive, swift and global transformation of our relationship to each other and the planet that sustains us. 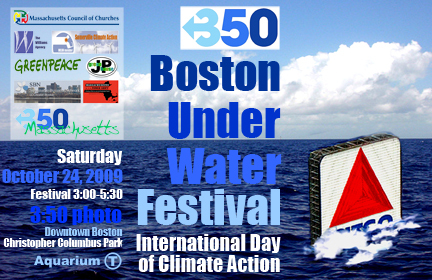 we face a devestating series of environmental catastroprophes, with climate change top of the list. The idea is so horrifying and the scale of the problem so outsized that it is difficult to come to terms with - and most people don't. Even those who are charged with finding a way to stave off cataclysm find it difficult to trully accept the terrible realities before us and, as a result, we are livingin a strange, dualistic world where things proceed as usual in civic and private life – the economic crisis is attended to, families set aside money for kid's college and retirement, friends jet off on ski vacations, and so on – even as the distance to a point of no return is measured in years, or possibly months. How do we live in these times? What should we be doing? Is there some way to break through the wishful thinking and cognitive dissonance that infects our political and civic lfe? Why aren't our political leaders, parties and institutions doing a better job? 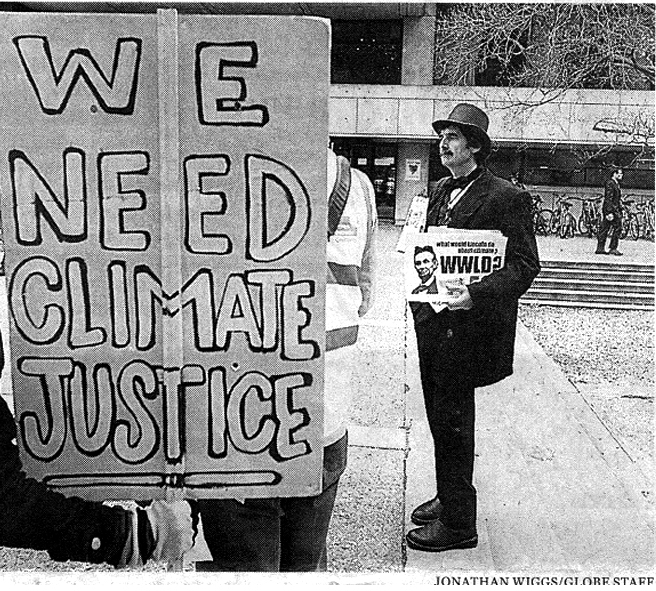 Can we accept the realities that climate scientists present and still find room for hope and means to experience joy? What kind of life awaits our children and how can we best prepare them for it? If one accepts what appears most likely and yet strives to keep fighting for a better outcome, these seem to be the pertinent questions. Struggling to find answers, in my view, is what "climate action" is all about, and that's the conversation I am interested in engaging through our project, and on this page are resources for the forms of action we think most important to take – particularly our work as a campaign hub for Bill McKibben's 350.org and Mass Climate Summer, a 350.org project of Mass Power Shift, Mass Coalition for Healthy Communities and Mass Council of Churches. Simon Zalesky heads to Boston Step It Up rally in 2006. JP Green House helped lead a coalition of 350.org Greenpeace US, Climate SOS, Somerville Climate Action and other activists critical of ACES legislation (Markey-Waxman in the House, Boxer-Kerry in the Senate), pushing President Obama at his recent MIT appearance to heed climate science. 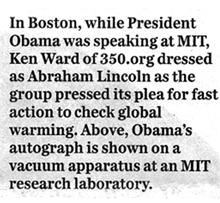 MIT students attending the speech had copies of a letter signed by Mass environmental leaders (download available above), while outside Ken, dressed in Lincoln era clothing, handed out material titled "WWLD?" - "what would Lincoln, the other tall, slim politician from Illinois, do?" 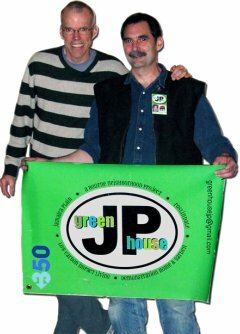 Bill McKibben announces JP Green House will serve as hub for 350.org campaigning.